The new VELUX white-painted roof window is now the new standard and a great addition to the existing clear lacquer and polyurethane VELUX range. Lighter, brighter modern interiors are more popular than ever. 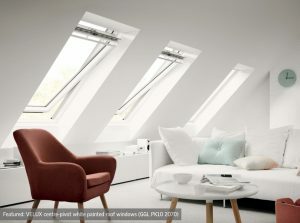 Meaning the demand for VELUX white-painted roof windows is growing too. Reflecting far more light back into a room than a traditional, darker surface would, the low-maintenance, high quality white finish will transform your home. 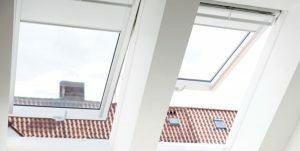 The new GGU & GPU White uPVC VELUX Window, White Painted Top Hung and GGL Range have all the enhanced features of the VELUX New Generation ThermoTechnology. The New Generation of VELUX window is equipped with ThermoTechnology high performance featuring EPS insulation materials to increase the energy efficiency of the window. There’s a larger pane size in the new generation, through a reduction in the frame width, allowing more daylight and warmth to flow in through the window. The white polyurethane coating of the GGU windows make them ideal for high humidity rooms such as bathrooms. The uPVC provides extra protection against the humidity for the internal pine frame and prolongs the lifespan of the window. 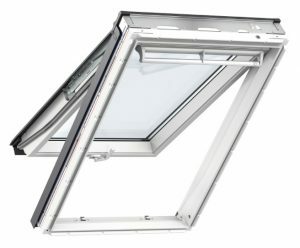 The white frame is fast becoming the most popular style of VELUX window for a loft conversion. The white colouring gives it a more neutral appearance which suits a range of interior styles. It also helps the window to blend into the ceiling, enhancing the feeling of space in the room. 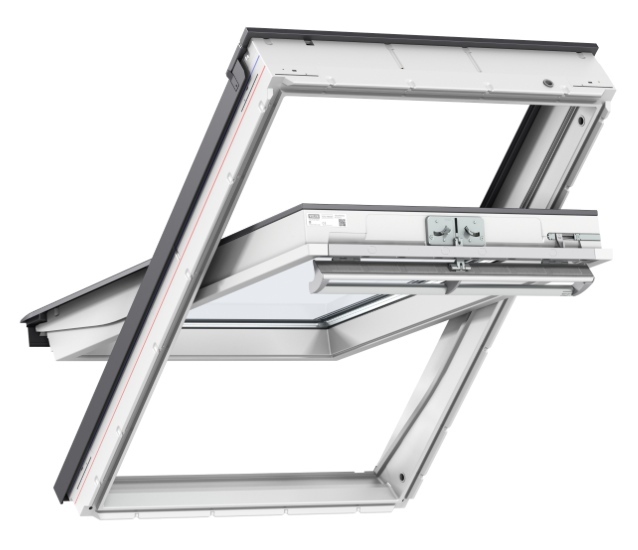 The New Generation of the white painted VELUX window is also equipped with ThermoTechnology. Double-glazed, top hung, timber roof window with 6mm toughened outer pane, 15mm argon gas filled cavity and 6mm laminated inner. 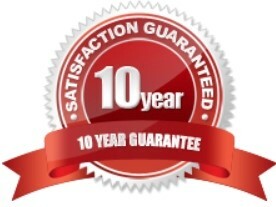 Provides more light, comfort and the enhanced glazing saves energy, improves security and reduces noise. Sound deadening cladding parts further enhance noise reduction. VELUX Centre-pivot roof windows are operated via the top control bar, making it easy to open, even with furniture below the window. Easy to open and quick to close with the top control bar. Low installation allows for easier operation and better views. 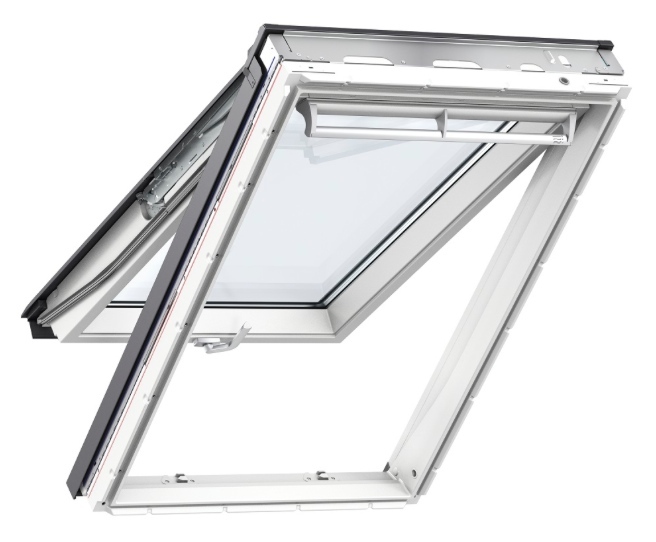 VELUX top-hung roof windows have all the benefits of the centre pivot window with the exception of having a larger area when opened. They are operated by a handle at the bottom and open outwards, allowing you to take advantage of uninterrupted views and a feeling of extra space. Suitable for roof pitches between 15° and 55°. Also suitable for roof pitches between 55° and 75° with special springs. Due to the unrestricted opening area, a large selection of roof windows are suitable for emergency escape purposes, typically with a bungalow loft conversion. 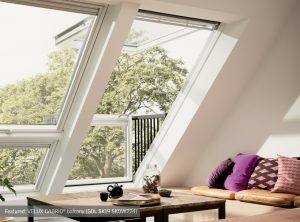 The VELUX CABRIO® balcony transforms from a roof window into a balcony in seconds. This is a great way to add real wow-factor to a property. Can be easily combined with additional top-hung and fixed sloping roof windows to increase the daylight and view. Made of high quality white painted natural pine. If your roof area is large enough why not make the most of your loft conversion. Coupling VELUX windows together will not only look amazing but will flood the room with natural daylight. With over 20 years experience designing and constructing loft conversions we have some great ideas and tips to make the most of your loft. This duo blackout blind offers the best of both worlds – almost complete blackout by night and soft difused light by day. A great choice for a study or guest room. Blackout at any time. OEKO-TEX® certified. Softly difuses incoming daylight. Stepless positioning. Slimline design. Pick&Click!TM system – installs in minutes. Ideal for studies and guest rooms. The blackout blind with extra insulation. Creating dark and cosy bedrooms. Fabric offers complete blackout. Double-pleated cloth. Protects against cold from the outside. Slimline design. Pick&Click!TM system – installs in minutes. 12 different colours and designs. Silent mode and soft stop. Ideal for bedrooms. Blackout effect blinds with child friendly designs give the right balance between sleep and play. The first choice for a little one’s bedroom. 22 designs including our new Disney & VELUX Goodnight Collection and Star Wars & VELUX Galactic Night Collection. OEKO-TEX® certified. 99.9% blackout from sun or moonlight. Pick&Click!TM system – installs in minutes. Ideal for children’s bedrooms.